Witches have long been accused of–and killed for–being associated with the Devil. At Samhain, in particular, when the veil between the worlds is thin, people’s fear of the Devil may be intensified, and thus their fear of witches. In most ways, such people are terribly mistaken. Witches do not “worship the Devil;” how can we, when we don’t believe in a literal Devil or a literal Hell? Yet, there is an element of truth in the religious patriarchy’s irrational fear. At Samhain, we do get in touch with what the Devil represents: the unconscious. The Devil is feared as the one who leads people away from the light. Pagans do not adhere to this dualism. We know that dark and light are one, as are the conscious and the unconscious. Although we may not be aware of them, we all wear chains that hold us to some reality. We all are influenced by temptations and vices; we all participate in harmful behaviors. We stay in relationships that prohibit us from reaching our potential. We reach for cigarettes or junk food to numb difficult emotions. We believe we are unworthy of abundance and thus do not receive it. We choose the easy or the safe way. We do not give as much as we could. We make decisions based on fear. Is this the work of the Devil? Yes, but it’s not something to fight or fear. We are not meant to conquer the Devil, but to understand it. The Devil is a part of us. It is not the behaviors themselves, but the energy behind them. The Devil is whatever we want to hide, whatever truths about ourselves we fear to acknowledge. We can see this in the representation of the Devil in Tarot. Take, for instance, this version from a Rider-Waite-inspired deck. The Devil appears as in popular imagination: red with horns, tail, and cloven feet. He sits in the darkness above a man and a woman, both chained to a tiny wall. Yet, what is he doing? He is not keeping the people where they are. In fact, their chains are loose enough that they could escape if they wanted to. Notice too how the Devil is shining light upon them, waving to get their attention. However, they are too afraid to look into the dark to find their freedom. Like Death, the Devil represents not a final destination but a gateway. He is the guardian of the unconscious. 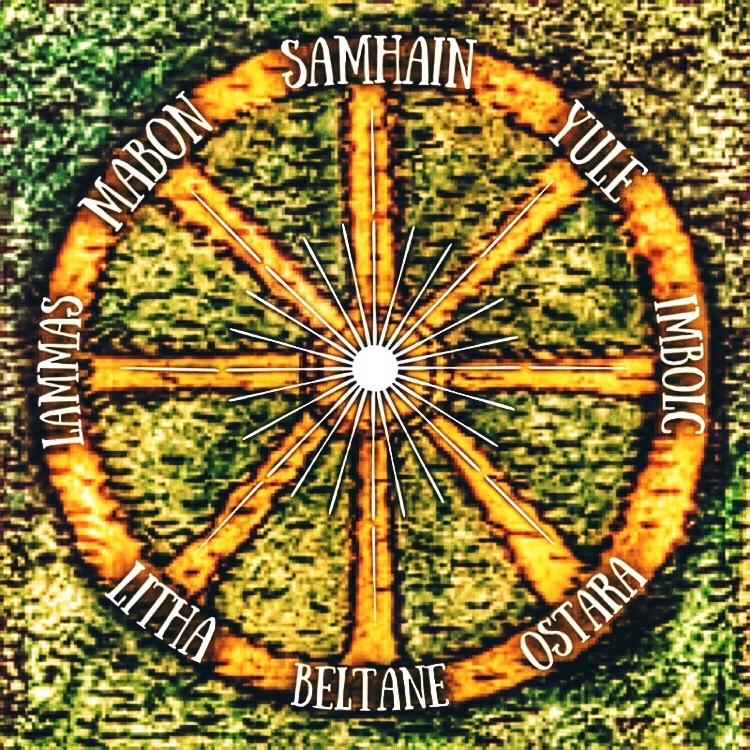 In the Wheel of the Year, the God has taken his position as the Lord of the Underworld at Samhain. He has brought his Goddess to join him, and he gathers departed souls as they cross over into their next state of being. When we meet the Devil, we need not fear him. He is not leading us to hell, but to a deeper understanding of how we have created our own hells. He shows us our chains: how we have bound ourselves to harmful patterns and energies that prevent us from growing into our truest, best, and freest life. If the Devil is scary, that’s a sign of something we fear to admit about ourselves. If we turn away from this fear, rather than dealing with it, we keep ourselves energetically bound to the past. To fully enjoy our lives as we are meant to, we must accept our whole selves, the darkness and the light and everything in between. There is no shame in having a dark side. There is only shame when we try to hide parts of ourselves. The act of burying truth is what creates a Hell. At Samhain, witchy folk may commune, or “dance,” with the Devil, because this is the way to the new life. We reflect on the lessons of this past year. We settle our debts. We honor our dead and help them find peace. We free ourselves from the energies of the previous cycle by meeting them, accepting their wisdom, and laying them to rest. We do not shirk from the darkness. We walk through it, knowing that we will find truth and freedom.